The word is out in accounting circles that SMSF work can make for a nice boost to a firm’s bottom line. But just as with any other attempt at service expansion, there are risks to both your time and your firm’s finances. If you’re considering SMSF outsourcing as a way to mitigate those risks (and you should be) there are a couple of points you should keep in mind. SMSF work can be fairly complex so if you’re not already familiar with the processes involved you’re going to need some training or at least a solid chunk of time to get yourself up to speed. That of course means that you (or your chosen employee) are spending time where you’re not working on billable files. An alternative to SMSF outsourcing is that you hire new talent in that is already up to speed on SMSF work. But here again you’re spending time and money, in this case head-hunting for that new employee. Plus you’re going to have to spend even more time and money ramping up to accommodate new workers – furniture, computers, benefit packages, training in your firm’s particular processes, SMSF software, and so on. Alternative number two is to shuffle the work off to an SMSF specialist house. However this isn’t a great deal because while on the surface you can say you’re expanding your menu of services to include SMSF work a big portion of that new income is going to go to that specialty house. In effect you’re merely a middle party between the client and the house – and middle parties always run the risk of being cut out. On the other hand SMSF outsourcing puts the profits of the new service right in your firm’s proverbial pocket. The outsourced workers – all of them already fully trained – work directly for you. They are, in essence, your employees, not a specialty house. But these are employees you do not have to house, and you won’t have to keep upping the offers to keep them with you if the competition comes sniffing for SMSF-knowledgeable talent. You put out the word that your firm is now accepting SMSF work. The SMSF beneficiaries/members send you their data. You pass the data on to your outsourced talent. Your overseas workers work the data and report back on whether or not the particular fund meets compliance requirements such as the minimum pension and the contribution cap. Ensure that the investment strategy is updated. Ensure that the Trust Deed is updated. Make sure that all of the current year’s copies of financials have been received. Make sure that the tax return has been entered correctly as per financials. Let you know if any documents or data is missing for compliance. The SMSF outsourcing workers will then prepare the audit work papers for you and your clients. 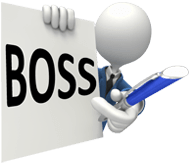 There’s even an added sweetener – BOSS provides all of these services on a casual basis so you don’t have to pay for any sort of minimum hour requirement and you can send work whenever you have it. That is an immense amount of grunt work off of your desk, all done for a fraction of the cost of working the file in-house.